PROEF! [EXPERIMENT!] is the joint course selection campaign launched by the DAS programmes. For both universities and students, it is important that students select a course of study fully commensurate with their interests and abilities. With the PROEF! campaign, DAS intends to familiarise students with the programmes in the Applied Science Domain and assist them to make a well-founded choice of course. The PROEF! campaign consists of a website, the course selection app Prapp!, a variety of promotional materials and the PROEF! range of teaching aids. PROEF! is made by Foundation C3. Most of the resources are available in the Dutch language only. Prapp! 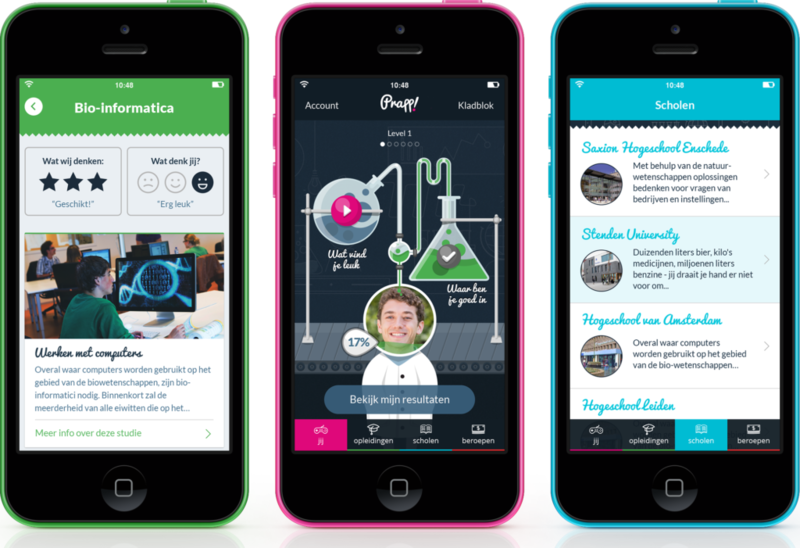 is a unique course selection app, specially developed for programmes within the Applied Science Domain. The app helps students to navigate the process of choosing a higher education programme. Prapp! contains mini-games in which students gain a greater insight into their own interests and abilities in a playful manner. The app also provides information on programmes, open days and occupations. Students and their parents can visit the PROEF.info website to find information on the programmes, universities and job opportunities within the Applied Science Domain. The website also provides a convenient list of open days and a page specifically for parents, where they can read about how to assist their child to choose a course. The website contains an English-language section with information on the English-language bachelor programmes in the Applied Science Domain and the universities that offer them. DAS universities include PROEF! in their own study information activities. In addition to the above materials, universities can regularly order new give-aways from C3. A tool kit is also available which includes illustrations, logos and sample slides and wording to make it easy for them to integrate PROEF! into their own information resources. Likewise, PROEF! beach flags can be ordered at cost price. Do have any questions about how to use PROEF! in your own information or would you like to order materials?